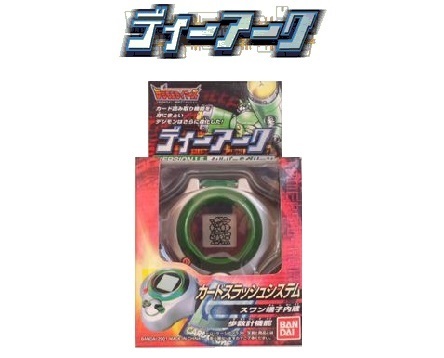 The D-Ark (ディーアーク) is the third in the series of Pedometer Digivices. You gain more Digimon as you progress throughout the areas by inputting their card numbers along with a symbol of Digi-code then slash the card. After certain amounts of battles, your Digimon will evolve into their more powerful forms. Progressing through the Area’s requires you to take ‘Steps’ which in turn is a mini pendulum clicking on the inside of the toy. Keep it attached to your belt and as you walk (or shake it manually) the counter will decrease leading you to the boss of the Area. Beat the boss to progress. Training: Here you can train your Digimon. Terriermon/Labramon – Shake (6 times for Child Digimon, 5 times for all others, this works for all evolutions as well). Guilmon – Push (Try to get over 27, this works for all evolutions and Dark line as well). Card: You can slash cards for items, or Digimon partners. You can only slash the Digimon you have seen to access them as partners. Slashing a Digimon you haven’t seen will result in an error. What Digimon you’ve seen will be in the Note section. Steps to slash are as follows. Note: The Digimon you’ve seen (and thusly are able to Slash). My Digimon: These are the Digimon you’ve slashed in the ‘Card’ Option. The more they fight, the stronger they get. You can have eight Digimon, two from each level. Item: These are the items you’ve gotten from Impmon, or Slashing. You can hold a maximum of three of each item. Medical: Heal your Digimon after a lost battle, or it won’t be able to walk or fight. Network: This consists of two options. Battle Option: Battle the Pendulums, D-3/D-Terminal, and D-Ark. Trade Option: Allows you to trade items with another D-Ark. Pressing the ‘cancel’ button while your Digimon is on the screen brings up the map. Pressing the ‘accept’ button shows you how many steps are left, and how many have been taken, along with what area you are currently in. Press ‘cancel’ to exit these screens. Battle (Kougeki): This sends your Child Digimon into battle. Afterward, a code insertion screen appears, and you may enter a code of an option card. Evolve (Shinka): You may evolve here. After the evolution, you will begin the Battle phase, including the Card Slash sequence. (This option does not appear until you are able to evolve). Trade (Nakama): This allows you to switch between different Partner Digimon during battle. Afterwards, you are returned to the Battle Menu. My Digimon: Your slashed Digimon rest here. You will also have access to whatever evolution line you have set up. These Digimon have the potential to be stronger or weaker than Partner Digimon, depending on how much they’ve battled. Slashed Digimon are not able to train. Guilmon – Attributes Vi, HP7, and AP2. MegaHit: Push more than 27 times. Growmon – Attributes Vi, HP10, and AP2. MegaHit: Push more than 27 times. MegaloGrowmon – Attributes Vi, HP13, and AP3. MegaHit: Push more than 27 times. Dukemon – Attributes Vi, HP14, and AP3. MegaHit: Push more than 27 times. BlackGrowmon – Attributes Vi, HP10, and AP2. MegaHit: Push more than 27 times. BlackMegaloGrowmon – Attributes Vi, HP13, and AP3. MegaHit: Push more than 27 times. ChaosDukemon – Attributes Vi, HP14, and AP3. MegaHit: Push more than 27 times. Digimon evolves into the Adult stage after 10 wins, Perfect after 15 wins and Ultimate after 20 wins. The Dark Guilmon line evolves as follows. You can only have one of each level, but which one that is depends on the conditions you meet. If Guilmon has two or fewer losses after 10 victories it will evolve into Growmon. Three or more losses will result in BlackGrowmon. If you get 20 victories, and you have 79% or less Win Ratio you will get ChaosDukemon. An 80% Win Ratio or higher will get Dukemon. If you feed an Evoluter to Guilmon before his Adult stage has been established, it will become BlackGrowmon when it’s ready to evolve. The same is for the higher evolutions. A different tune than that of an enemy or boss tune marks Impmon’s appearance. Try to have your Digimon at the adult level, trained, and a plug-in is useful as well. When you confront Impmon initially, you must accept his challenge. Once you see him, you must shake to chase him down, but if you don’t get him, there is no penalty or reward. If Impmon has a partner Digimon, and you beat him, then you will have access to that new Digimon. If you lose, your loss will be recorded, and you’ll have to wait for Impmon again. Impmon does not always carry partners, he also carries items.